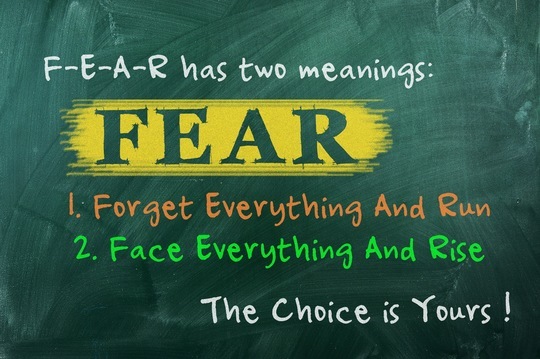 In his first inaugural address, Franklin Roosevelt famously stated, "The only thing we have to fear is fear itself." At the time of this proclamation, the U.S. was nearing the depths of the Great Depression. Millions were discouraged and convinced things would never get better. In reality, these people had some real reasons to be afraid, but the false evidence they were seeing made their fear paralyzing for many. The idea of self-generated fear is now a concept that professional consultants and coaches now express in the acronym : F.E.A.R. or False Evidence Appearing Real. This is a way of expressing a fear of the unknown and the future, based on current perceptions of events and other "circumstantial evidence." Although the sense of fear this false information creates is real, it can be effectively managed by realizing it is actually subconscious, manifested worry. This type of FEAR creates apprehension, can progress to forms of paranoia, and even paralyze your ability to be proactive in accomplishing your goals. Oftentimes, the only way to resolve this debilitating problem is to consult with an experienced and qualified third-party who understands the problem. As with many subjective issues, your FEAR can overwhelm the objective truth, and it can blind you to viable options. As with many things in life, the communications between a franchisor and prospective franchisee can result in misunderstandings, confusion and misperceptions. There is a natural source of potential tension between these two parties that can result in difficult situations, regardless of the best intentions and efforts of both parties. It's helpful to examine for a moment why these difficulties are to be expected. First, the franchisor is working hard to grow their business by adding quality franchisees. These business people invest a great deal of time and effort in developing a workable business model with training and support systems. When a new franchisee is signed up, there is an expectation to provide training and to help that new team member through the setup up and implementation phase. However, the franchisor also expects to wean a new franchise operation after a certain period of time, and is looking for franchisees to operate as independently owned businesses. On the other hand, the prospective franchisee works hard to overcome the fears and insecurities associated with starting a new business, especially with a large monetary commitment. When they hear terms like "we will work with you" and "we're here to help you" it is easy to misread this as providing an ongoing womb-effect that covers all anticipated problems and challenges. In other words, the mental emphasis is often more on maintaining that umbilical cord, rather than separating it. When an experienced, professional franchise coach enters the picture, there is an instantaneous benefit to both the franchisor and the franchisee. These coaches understand the F.E.A.R. syndrome often affects both sides of the equation in the franchise world. The franchisor is accountable to a growth plan that investors, employees and existing franchisees are depending upon. At the same time, the franchisees are focused on their specific commitments, market and operations. They both may see false indicators of problems or potential problems and be discouraged or worse. Having that professional business coach is often invaluable in pulling back the curtain on these unsubstantiated fears and concerns. With the insights and skills of the right coach, both franchisees and franchisors can recognize their own capabilities, and work toward overcoming those discouraging concerns. The problems of running and growing a business are real enough and challenging enough on their own. Adding to them because of F.E.A.R. is a futile exercise that the right franchise coach will help you avoid. Thom Torode is a NJ based Professional Executive & Business Coach. He has owned over 5 different businesses and is currently the Managing Director for Sunrise Business Advisors. Thom's expertise includes working with those business owners who have plateaued getting them unstuck and back in growth mode. Additionally, Thom works with both franchisees and franchisors in helping them develop their leadership. Thom is also Director Consultant with BNI. When not helping business owners and their teams create the business and lives they want and need, he can be found following his kids activities.